The flag of the Olympic Games in Sarajevo '84 is white with red emblem consisting of Olympic rings and four-sided snow-flake. Flags in other colours were used for ornamental purposes, but this seems to be official version. Today I photographed the banner of today's ZOI'84 Olympic Centre Sarajevo. ZOI'84 Olympic Centre Sarajevo is the legal successor of the Organization Committee of the XIV Winter Olympic Games with all its sport and leisure facilities. 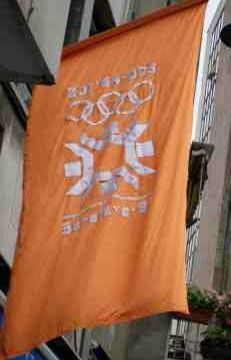 It's a orange flag with Olympic rings and four-sided snow-flake Above there is an inscription "ZOI'84 - OCS", and below there is an inscription "SARAJEVO'84". Official site of Olympic Centre Sarajevo at <www.zoi84.ba>.